If you’re planning to remodel a bathroom or build a bathroom addition to your home pay special attention to illumination. Bathroom lights and mirrors can create dynamic effects. When selecting lights for a bathroom consider light sources, functional lighting and aesthetics. Mirrors play into the design because they are an important element in a bathroom, reflect light and can add architectural detail. Interior designers often look at lighting in a room in layers. The layers include natural light, task lighting, ambient lighting, accent lighting and decorative lighting. 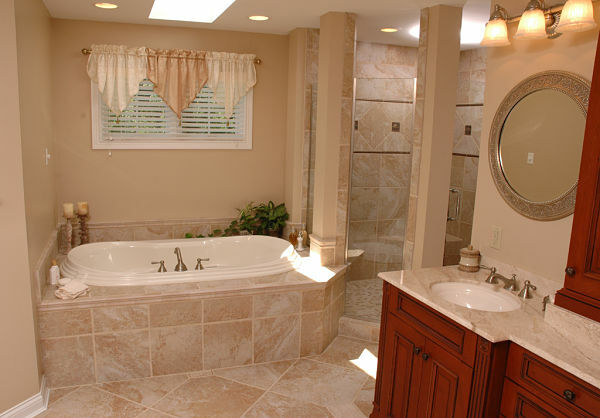 Bathrooms tend to be small spaces, often with a small window or no window at all. Natural light can be problematic due to privacy considerations and heat loss. Many homeowners use window coverings in a bathroom unless their home is located in a setting where privacy is not a problem and they want to capitalize on a view of the outdoors. Skylights and sun tunnels can be an option for bringing natural light into the room without compromising privacy. 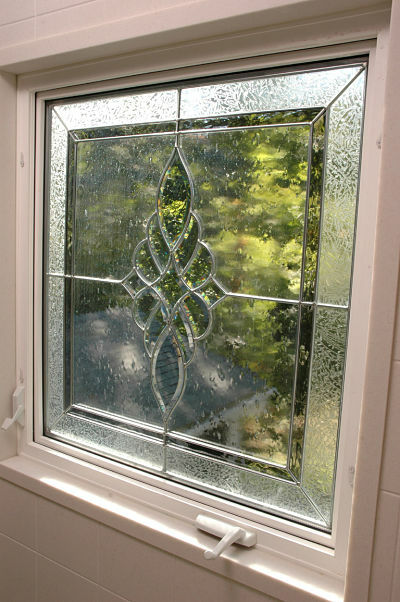 Another way to optimize sunlight in a bathroom is to install a stained glass or textured glass window that provides privacy and a source of natural light. 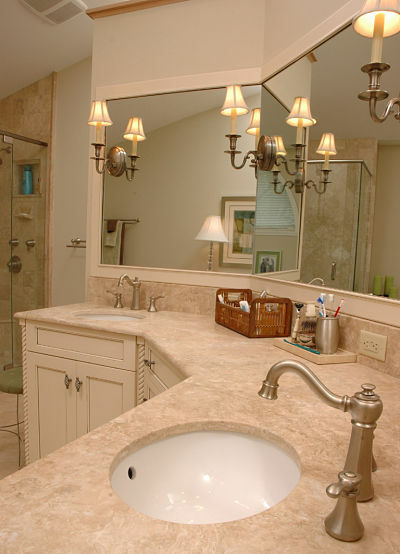 The primary areas for task lighting in a bathroom are the vanity, shower and tub. Bath designers often recommend two lights for a vanity, one on each side of a mirror for make-up application or an over-the-mirror fixture to optimize general illumination. 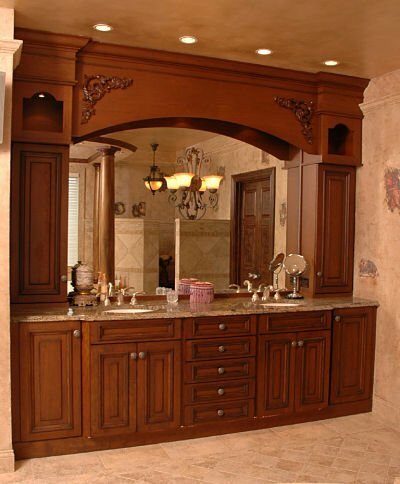 Placement of vanity lights will depend on the size and form of the mirror. Generally, sidelights are placed at least 30 inches apart and at eye level. For concentrated vanity task lighting, lights can be installed directly onto the mirror. 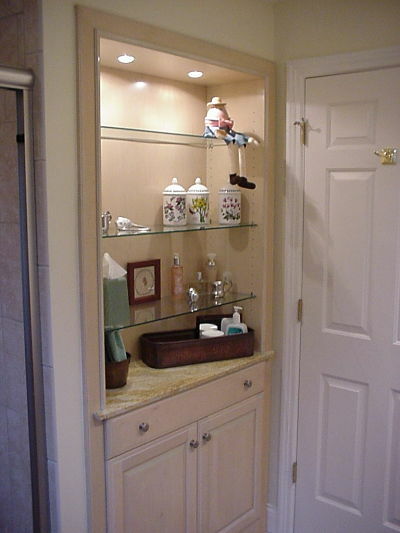 Incandescent light bulbs have long been the first choice for lighting a vanity area. They make skin tones look better and provide proper illumination for shaving and make-up application. However, the incandescent light bulbs commonly used by consumers are being eliminated. Production of 100-watt and 75-watt incandescent light bulbs was halted in 2012 and 2013. As of January 1, 2014, 60-watt and 40-watt bulbs will no longer be made. What are your best options? There are two choices: Compact Florescent Lights (CFLs) or Light Emitting Diode (LED) lights. CFLs produce a bluish light and have a corkscrew shape that is not attractive if exposed in light fixtures. They are longer lasting, save on energy use and are affordable. CFL manufacturers may improve on the illumination and appearance of the bulbs in the future. An uplight opaque glass fixture will solve the problem of unattractive CFL lights. LED lights are more costly but last the longest. The light output of an LED bulb is concentrated and not diffused. If you’ve used an LED flashlight you might have noticed the difference. You may want to try out CFL and LED bulbs in a home store or lighting store display before deciding which may be best for your home. If you plan to use dimmers in your bathroom check the package to be sure the bulbs will work with dimmer switches and what type of dimmer switch is required. 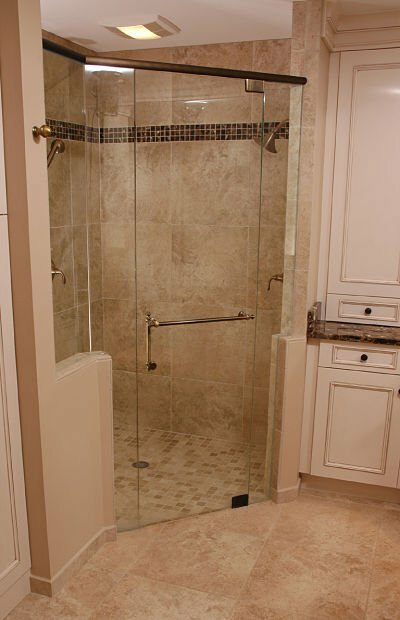 Many homeowners choose recessed lights for a shower and tub. 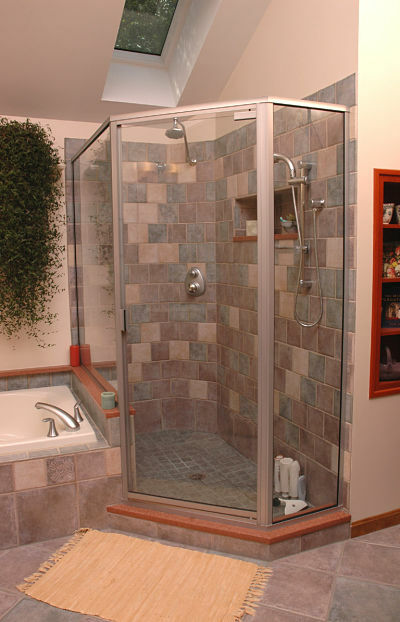 They can be placed either directly over the shower or tub, or just outside the space. Natural light can also be used to illuminate these areas by adding a skylight or sun tunnel or installing the tub or shower near a window. In small bathrooms, fan/light units that provide both illumination and ventilation are very efficient. Manufacturers are creating new styles of fan/light units with decorative globes and trims to provide more stylish options. Ambient lighting refers to the general lighting within a room. In many bathrooms ambient lighting is provided by recessed ceiling light fixtures. A centrally placed globe or chandelier fixture can also be a source of ambient light in a bathroom. You may want to talk with a bath designer to determine the right size fixture for your room and about options such as dimmer switches to create a relaxing environment. 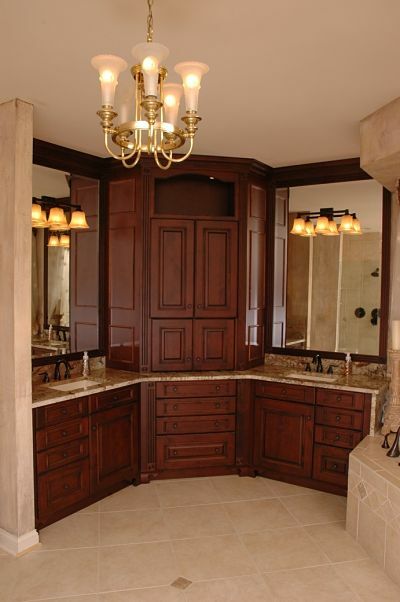 Accent lights can be used in a bathroom to highlight niches, shelving and cabinets. Accent lights are usually small, recessed puck lights. 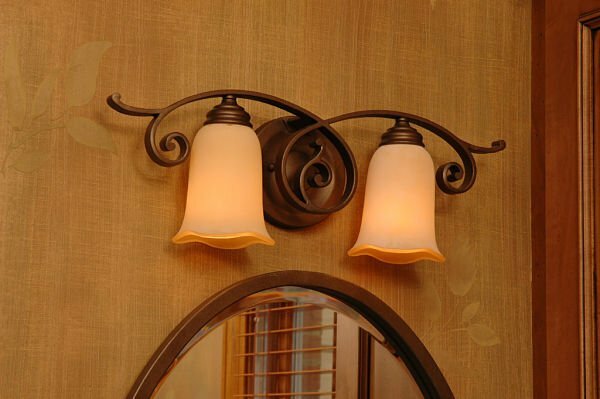 Decorative lighting is the impact a fixture itself makes in a room. Light fixtures and mirror frames can be used to make a design statement. Colorful and shapely globes, pendants and chandeliers can give definition and style to a bathroom, especially when matched to mirror frames. Also consider using dimmer switches to add ambience. Discuss options for the placement of lights and light switches with your contractor. For safety, you may also want to install a “night light” which can be a light on a dimmer switch.